"Britain's Trillion Pound Horror Story airs tonight at 9pm on Channel 4. The film explains the full extent of the financial mess this country is in – an estimated £4.8 trillion of national debt and counting. It argues that the recent spending review hasn’t gone far enough, and to put Britain back on track we need to radically rethink the role of the state, stop politicians spending money in our name and drastically lower taxes to make Britain’s economy boom again." It's been made by Martin Durkin, the guy that produced "The great global warming swindle"
Probably won't be a surprise to HPCers but a little bit of attention given to the real scale of the debt isn't a bad thing. Oh well at least it's all electronic and in the worst case we always have the delete button. "to make the economy boom again". What? Like last time? No thanks. I've got it on SKY+ nontheless, worth a watch I guess. He is going for the Total National Debt, hence including households. It is important the the nation learns, and faces it, that they were "all in this together", creating this fecking mess! The government always leaves unfunded pension liabilities off the balance sheets. Anyway,its not 4.8TR, its more like 10TR by 2012 if PWC are right, and they probably are. But hey--more debt is good isn't it? Too big to fail and all that? I'm beginning to find this way of looking at things a bit trying. It's like saying when someone is born, add up all their future liabilities for food, shelter, clothing, utility bills -basically everything they might spend in a lifetime -and then saying that is their total debt. Ridiculous. Another point is, it's surely only how we are relative to other nations that is important. Every major nation in the world is in colossal debt, it's just some are more honest than others in their accounting systems. Hope his graphs don't stop in 1980 this time. Can't remember where but I seem to remember reading something somewhere about ancient Mesopotania when this sort of thing happened (Debt getting out of control) they just had a massive feast and booze up and cancelled everyone's debt effectively resetting the economy, if true it's one ancient tradition I'd like to see brought back! If you overlay this problem with the Laffer curve (I don't know the exact shape of it or the peak but I am pretty sure that it exists) and I think that the problem with future obligations is pretty apparent. I am begnning to wonder whether they have already exceeded the nation's ability to suuport the future obligations. Except that cancelling debt also means cancelling credit (savings). Alright if you've converted your savings to assets though. Even better if you took out loans to buy those assets, leaving you sitting pretty. In short, great if you were feckless or knew it was going to happen. He is more probably (hopefully) thinking along these lines, below. Similar to Mckinsey's from Feb2010. Bank for International Settlements (BIS) report. UK Total Debt (Gov.+ Households + Companies) / GDP still going up. First solid data that I am aware of since the McKinsey report showed total debts up to 2008. This BIS report comes all the way to 2010. The point of a debt jubilee is to temper people's behaviour in expectation of it happening on a regular basis. If a jubilee were announced as a one off, it would be really destabilising. 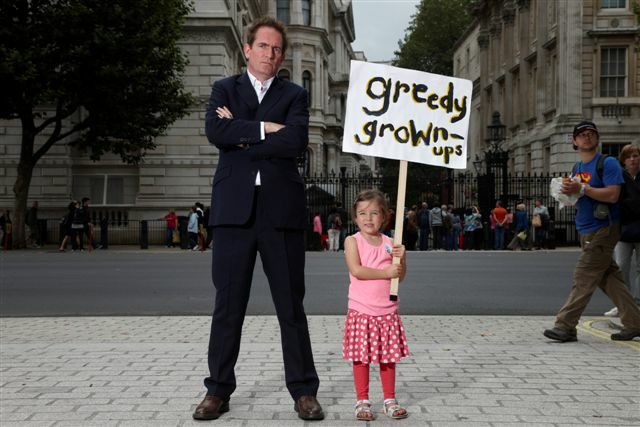 Maybe a government debt jubilee - not for us little people. Another point is, it's surely only how we are relative to other nations that is important. Yep, that is exactly how African countries think. Well if that is going to happen, let me know in advance, so I can rack up a few humongous debts first. Not really. See post #13 above. That is real current debt. We might get a stiff talking to from one of the G20! I still say money is not earned. It is issued. We then simply have to trick world markets into thinking our bits of paper are worth x amount relative to some other nations' bits of paper. All nations are playing the same game. "Britain's Trillion Pound Horror Story airs tonight at 9pm on Channel 4. Just 2 hours to go now. This will be good. Even if badly done, it'll still be bear food for the masses, well, for the half a million watching channel 4. Still good. Finally!, someone with a sense of humor left, come on, if we all over eat, and wake up with massive hangovers, when we see the devastation we're going to get anyway at least we can say "wow, that must have been some party!"